For clostridial myositis and myonecrosis (gas gangrene) or spreading clostridial cellulitis with systemic toxicity (or a presumptive diagnosis of either) the preferred treatment is a combination of hyperbaric oxygen (HBO2), surgery, and antibiotics. Clostridial myositis and myonecrosis or gas gangrene is an acute, rapidly progressive, non-pyogenic, invasive clostridial infection of the muscles, characterised by profound toxaemia, extensive oedema, massive death of tissue, and a variable degree of gas production. Gas gangrene is either an endogenous infection, caused by contamination from a clostridial focus in the body, or an exogenous infection, mostly in patients with compound and/or complicated fractures with extensive soft tissue injuries after street accidents. The infection is caused by anaerobic, spore‑forming, Gram‑ positive encapsulated bacilli of the genus clostridium, discovered by William H. Welch in 1891. More than 150 species of clostridium have been recognised but the most commonly isolated is C. perfringens type A (95%) either alone or in combination with other pathogenic clostridia, C. novyi (8%), C. septicum (4%), and C. histolyticum, C. fallax, and C. sordelli (1% or less of the infections). A further subdivision can be made in clostridia that are toxogenic, i.e., C. perfringens, C. septicum, C. novyi, and clostridia that are believed to be only proteolytic, i.e., C. histolyticum, C. bifermentans, C. sporogenes, and C. fallax, which augment an infection by their proteolytic capabilities but do not cause the classical gas gangrene syndrome. C. tertium, C. sphenoides, and C. sordelli can be considered as contaminants. It is not known if and what these microorganisms add to the disease process. The essential role of alpha-toxin in the pathogenesis of gas gangrene was recently confirmed by Williamson and Titball, who developed a genetically engineered vaccine against alpha-toxin. Immunisation with the C-Domain of α-toxin proved to be of value in animal experiments. Clostridium perfringens is not a strict anaerobe; it may grow freely in O2 tensions of up to 30 mmHg and in a restricted manner in O2 tensions up to 70 mmHg. The complete genome sequence of C.Perfringens has been published recently by Shimizu et al. The presence of clostridial spores and An area of lowered oxidation‑reduction potential caused by circulatory failure in a local area or by extensive soft tissue damage and necrotic muscle tissue. This condition results in an area with a low O2 tension where clostridial spores can develop into the vegetative form. More than 20 different clostridial exotoxins have been identified, nine of which are implicated in the local and systemic changes seen in gas gangrene; alpha‑toxin, theta‑toxin, kappa‑ toxin, mu‑toxin, nu‑toxin, fibrinolysin, neuraminidase, "circulating factor," and "bursting factor." The most prevalent is the O2‑stable lecithinase‑C, alpha‑ toxin, which is haemolytic and tissue‑necrotising. It destroys platelets and polymorphonuclear leukocytes and causes widespread capillary damage and is often lethal. The other toxins are ancillary to the alpha‑toxin, which gives rise to hemoglobinuria, hemolysis, jaundice, anemia, tissue necrosis, renal failure, and serious systemic effects such as cardiotoxicity and brain dysfunction. The other exotoxins are synergistic and enhance the rapid spread of infection by destroying, liquefying, and dissecting healthy tissue. The clostridial organisms surround themselves with toxins. Local host defense mechanisms are abolished when the toxin production is sufficiently high. This results in fulminating tissue destruction and further clostridial growth. Alpha‑toxin can be fixed to susceptible skin cells in 20-30 min, is detoxified within 2 hours after its elaboration, and causes active immunity with production of a specific antitoxin. The infection, however, is so progressive with continuous production of alpha‑toxin that the patient dies before any immunity can develop. Stevens et al investigated the role of theta-toxin in the pathogenesis of clostridial gas gangrene. They found evidence for the suggestion that theta-toxin in high concentrations is a potent cytolysin and promotes direct vascular injury at the site of infection. At lower concentrations, theta-toxin activates PMNs and endothelial cells, and in so doing promotes vascular injury distally by activating adherence mechanisms by PMN-dependent adherence molecules such as the integrin CD11/CD18. The rapid tissue necrosis associated with C. perfringens infection is related to progressive vascular compromise orchestrated by dysregulated host cell responses induced by theta-toxin. In earlier papers, Stevens et al already described the lethal effects and cardiovascular effects of purified alpha- and theta-toxins from C.perfringens. An extensive and updated review about the role of clostridial toxins in the pathogenesis of gas gangrene was given by Stevens and Bryant. Awad et al, showed genetic evidence for the essential role of alpha-toxin in gas gangrene. Eaton et al have further described the crystal structure in combination with the working mechanisms of alpha toxin. In conjunction with previous findings, almost the whole working mechanism with the structure of their toxin is known now. Stevens et al, also showed evidence that alpha- and theta-toxins differentially modulate the immune response and induce acute tissue necrosis in clostridial gas gangrene. Much more has become known in recent years about the action and also the interaction between the various clostridial toxins in the onset and progression of gas gangrene. A very informative review on a cellular and molecular model of the pathogenesis of clostridial myonecrosis, including the above mentioned data is given by Stevens and Titbal. The action of HBO2 on clostridia (and other anaerobes) is based on the formation of O2 free radicals in the relative absence of free radical degrading enzymes, such as superoxide dismutases, catalases, and peroxidases. Van Unnik showed that an O2 tension of 250 mmHg is necessary to stop alpha‑ toxin production. Although it does not kill all clostridia, it is bacteriostatic both in vivo and in vitro. Tissue O2 measurements made by Schoemaker, Kivisaari and Niinikoski, and Sheffield have shown that treatment with HBO2 at 3.0 atm abs is required to achieve tissue partial pressures above 300 mmHg. Free-circulating toxins and/or tissue‑ bound toxins are not affected by high O2 levels but they are rapidly detoxified by normal host factors. The diagnosis of clostridial myonecrosis is based primarily on clinical data, supported by the demonstration of Gram‑ positive rods from the fluids of the involved tissues as well as a virtual absence of leukocytes. A leukocytosis indicates a mixed infection. Roggentin et al. developed an immunoassay for rapid and specific detection of C. perfingens, C. septicum, and C. sordelli by determining their sialidase activity (neuraminidase) in serum and tissue homogenates. Sialidases produced by these three clostridia were bound to polyclonal antibodies raised against the respective enzymes and immobilised onto micro-titer plates. Applied to nine samples from patients, there was a high correlation between the results of the immunoassay and the bacteriological analysis of the infection. Scheven described identification of C.perfringens in mixed-infected clinical materials by means of a modified reversed CAMP-test. The onset of gas gangrene may occur between 1 and 6 hours after injury or an operation and begins with severe and sudden pain in the infected area before the clinical signs appear. This seemingly disproportionate pain in a clinically still normal area must make the clinician highly suspicious for a developing gas gangrene, especially after trauma or an operation. The body temperature is initially normal but than rises very quickly. The skin overlying the wound in the early phases appears shiny and tense and then becomes dusky and progresses to a bronze discolouration. The infection can advance at a rate of 6 inches per hour. Any delay in recognition or treatment may be fatal. Hemorrhagic bullae or vesicles may also be noted. A thin, sero-sanguinolent exudate with a sickly, sweet odour is present. Swelling and oedema of the infected area is pronounced. The muscles appear dark red to black or greenish. They are non-contractile, and do not bleed when cut. The tissue gas seen on radiographs appears as feather‑like figures between muscle fibres and is an early and highly characteristic sign of clostridial myonecrosis. Crepitus is usually present as well. The acute problem in gas gangrene is not normal tissue or already necrotic tissue, but the rapidly advancing phlegmon in between, which is caused by the continuous production of alpha toxin in infected but still viable tissue. It is essential to stop alpha‑toxin production as soon as possible and to continue therapy until the advance of the disease process has been clearly arrested. Since van Unnik showed that a tissue PO2 of 250 mmHg is necessary to stop toxin production completely, the only way to achieve this is to start hyperbaric oxygen therapy as soon as possible. A minimum of three to four HBO2 treatments is necessary for this response. Treatment starts on the basis of the clinical picture and the positive Gram‑stained smear of the wound fluid (without leukocytes). HBO2 treatment stops alpha‑toxin production and inhibits bacterial growth thus enabling the body to utilise its own host defence mechanisms. Although a three‑pronged approach consisting of HBO2, surgery, and antibiotics is essential in treating gas gangrene, initial surgery can be restricted to opening of the wound. An initial fasciotomy may be undertaken, but lengthy and extensive procedures in these very ill patients can usually be postponed, depending on how rapidly HBO2 therapy can be initiated. Debridement of necrotic tissue can be performed between HBO2 treatments and should be delayed until clear demarcation between dead and viable tissues can be seen. The first clinical results in gas gangrene were remarkable, but were difficult to reproduce in the animal model. Despite wide variations in O2 tolerance between small and large laboratory animals and human beings, HBO2 therapy has been used to treat experimental clostridial infections in animals. The greatest reduction in mortality in dogs was achieved by a combination of HBO2, surgery, and antibiotics. In general, studies of several investigators have shown that HBO2 substantially reduced mortality and morbidity in animals following clostridial infections, when used in combination with surgery and antibiotics. Major retrospective clinical studies indicate that the lowest morbidity and mortality are achieved with initial conservative surgery and rapid initiation of HBO2 therapy. Results decline progressively when HBO2 therapy is delayed. Early aggressive surgery and delayed HBO2 treatment lead to a significantly higher mortality and morbidity than when HBO2 is administered promptly. Ertmann and Havemann indicate, on the basis of their experience in a series of 136 patients, treated over a twenty year period, the necessity for a combined treatment approach. 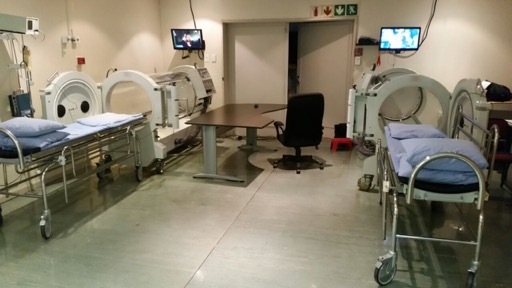 However, they place surgery earlier in the protocol, sometimes after the first hyperbaric session already. All patients treated without hyperbaric oxygen or only once or twice, died. The work by Brummelkamp et al. updated by Bakker totaling 409 cases of clostridial gas gangrene showed a mortality directly related to the clostridial infection of 11.7%. All 48 patients who died did so within 26 h after the start of HBO2 therapy. HBO2 therapy also greatly reduced the amputation rate: only 18% required amputation post-hyperbaric therapy vs. 50-55% following primary surgery. Hart et al. reported a 17% amputation rate with combined therapeutic management. Reduced mortality rates were also demonstrated by Hart et al., Hitchcock et al., Holland et al., Van Zijl, and Heimbach. Heimbach showed a 5.1% mortality rate among 58 patients whose HBO2 therapy began within the first 24 hours; these results reinforce earlier clinical trials. Mortality in the series of Hirn was 28%. He concluded that mortality and morbidity could be reduced if the disease is recognised early and appropriate therapy applied promptly. He recommends adequate and operative debridement, antibiotics, HBO2, and surgical intensive care. In experimental mono-microbial gas gangrene, the combination therapy of surgery and HBO2 started 45 min after the inoculation of bacteria, reduced mortality to 13% compared with 38% with surgery alone. The combination therapy appeared to be especially effective in wound healing and in prevention of morbidity compared with surgical debridement alone. The effectiveness of the combination therapy was strongly time dependent. In the multi-microbial gas gangrene model, the addition of HBO2 to surgery tended to reduce mortality, but the difference between the groups was not statistically significant. However, the combined therapy with surgery and HBO2 was highly effective in reducing morbidity and mortality and improving wound healing compared with surgical debridement alone. It is life‑saving because less heroic surgery needs to be performed in gravely ill patients and the cessation of alpha‑toxin production is rapid. It is limb and tissue‑saving because no major amputations or excisions are done prematurely (except opening of wounds). It clarifies the demarcation, so that within 24-30 hours there is a clear distinction between dead and still‑living tissue. In this way, both the number and the extent of amputations are reduced. In 1984 Peirce already concluded that the modern treatment of gas gangrene involves the simultaneous use of antibiotics, surgical debridement and hyperbaric oxygen. He also believed, that even at that time, it would be unethical to carry out a randomised clinical study to compare these three modalities. This opinion was based on the results published until 1984. Subsequent experience continues to support the approach he recommended. With the same therapy these results have been consistent over the years, and the outcome has been further improved with advanced intensive care medicine. The purpose of this web site is to offer Dr Weir’s patients and their families access to information regarding vascular disease in general as well as specific information on certain disease processes. The information on this site does not necessarily apply to all patients with the same diagnosis. If you are not a patient of Dr Weir, please do not regard the information on this website as a substitute for a thorough assessment by a qualified Vascular Surgeon. If in doubt, consult your doctor.